The astonishing diversity of terrain, the bustling cities and sheep-filled countries, the majestic castles, the lyrical nature, and the endlessly flowing goodness of Guinness draw tourists from all walks of life. Ireland is a small country with a big reputation, helped by a fascinating people whose friendly nature is expressed in the warmth of their welcome. 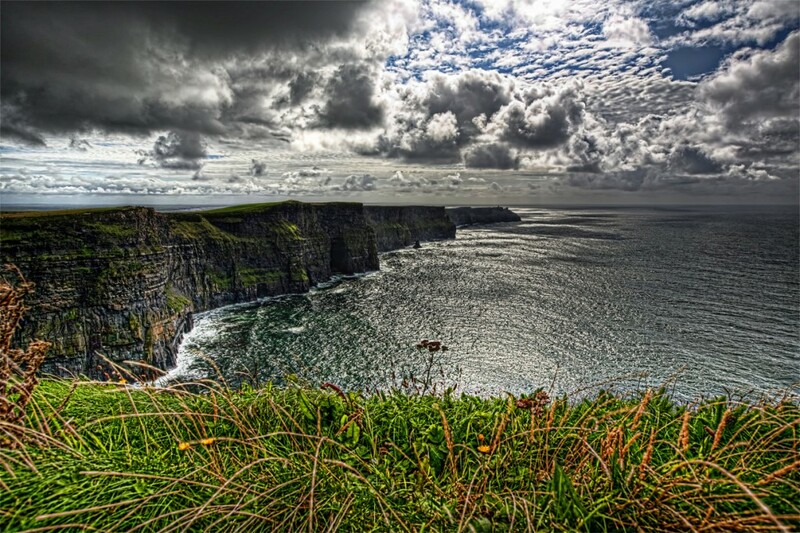 Cliffs of Moher– Entirely vertical and abrupt, the Cliffs of Moher rise to a height of 666 feet. On a clear day, the views are tremendous and from the cliff edge, you can just hear the booming far below. For the most spectacular vistas, sunset is the best time to visit. Giant’s Causeway – 38,0000 hexagonal basalt columns make up Northern Ireland’s main tourist attraction – Giant’s Causway. According to one of the legends, the giant Finn McCool fancied a female giant on the Scottish island of Staffa and built some stepping stones to the island where similar rock formations are found. The more prosaic explanation is that lava erupted from an underground fissure and crystallised some 60 million years ago. You can decide for yourself as you unlock the mystery and stories of the landscape in the exhibition area of the visitor centre. Guinness Brewery – Located in the heart of the St James’s Gate Brewery, Guinness Storehouse is Ireland’s number one tourist attraction and the black stuff really does taste better in its own country. Blarney Castle – Located in County Cork, this historic castle is known for its “Blarney Stone.” Tradition is that if the Blarney Stone is kissed, one will be blessed with great eloquence, better known as “the gift of the gab.” You can kiss the stone by lying back and being held by an employee of the castle. Photographers are there to capture the moment or you can take your own photo as well. Locals are rumored to pee on the stone so I’d consider wiping your mouth after your big moment. Tig Coili Pub– This pub, located just off High St. in Galway, is where I’d like to spend the rest of my days in a haze bliss. It’s well known for its nightly traditional Irish music sessions. During the summer months, you will see people overflowing from its front door. As a traditional Irish pub experience, Tig Cóilí has it all – great atmosphere, music and craic. Kilmainham Gaol – Kilmainham Gaol is a former prison located in Kilmainham in Dublin, which is now a museum. Dublin’s Kilmainham Gaol held some of the most famous political and military leaders in Irish history such as Robert Emmet, Charles Stewart Parnell, the 1916 Rising leaders and Eamon de Valera. It gives visitors a dramatic and realistic insight into what is was like to have been confined in one of these forbidding bastions of punishment and correction between 1796 when it opened and 1924 when it closed. Driving – Driving and road rules in Ireland are similar to those of the United Kingdom (drive on the left and yield to the right on roundabout). The most noticeable difference is the fact that distances are displayed in kilometres and speed limits in kilometres per hour (km/h) in the Republic of Ireland. Weather – Overall, Ireland has a mild but changeable oceanic climate. In Ireland, you may indeed experience ‘four seasons in one day so what to wear in Ireland could change from one minute to the next. Keep up-to-date with the lastest weather forecast. No matter the weather, expect it to be a topic of conversation among the locals and pack an umbrella because rain is more common than not. Language – English is spoken everywhere but Irish is the first official language. Money Matters – Mastercard, Maestro and Visa are accepted virtually everywhere. ATMs are widely available throughout Ireland. Even in small towns it is unlikely that you will be unable to find an ATM. Traditionally, tipping was never considered to be a necessity and was entirely optional. However, recently it has become common to tip up to 10% of the bill total.